When I joined MNE almost a year ago, I thought I knew accountants and the accounting industry. It’s easy to have preconceived ideas about a particular profession or industry, and it’s fair to say I had done the same for accounting. I know quite a few accountants locally from previous roles, seen my fair share of offices of both small, independent and national firms and so like anybody else, I’d felt I’d built up a strong enough picture of understanding what they do, how they operate and how they work. However, it’s only really now after getting up close and personal with the day-to-day running of our firm, understanding its challenges and its experiences with other firms, that I can truly say that I have solid knowledge of the industry. A common belief is that all accountants are the same, but actually this couldn’t be further from the truth. Below are 3 things I’ve learnt about accountants over the last year as a creative, a non-accountant if you will, that I hope will offer some new insight. I think what a lot of businesses do in a variety of industries – and where accountancy is no different – is they tend to generalise. It’s like being a creative and fantastic at branding, so good that you could if required provide corporate photography, but it wouldn’t be the same as going to a photographer who’s got all the kit, experience with lighting and so on. In accountancy, this may seem fairly obvious for some services such as tax where smaller firms are unlikely to have the resources to hire tax specialists in-house. However, what did surprise me was that some firms didn’t do what I thought were more bread and butter services such as bookkeeping. As touched on in our blog “Why your business needs killer bookkeeping”, there’s a belief that anyone can do bookkeeping. Most firms for that reason will give it a go, even if in their heart of hearts they know realistically they don’t have the processes in place to deliver the best bookkeeping service. This came to light when I found out that there’s a local firm we refer audit work to and they refer bookkeeping work in return – we both know it’s better to put our efforts and energy into our strengths and core services. If anything, this highlights the need for business owners to dig deep to properly understand the strengths of accounting firms and not just accept that all accountants are the same. 2. Some accountants are tech savvy! MNE is the most modern and forward-thinking company I’ve worked for. It’s like anything that could be considered a risk to the company or our clients has been considered, as well as anything that requires unnecessary effort and use of time. Everything is in the cloud from company files to our accounting software; there are mobile apps used for parts of accounting processes and many different pieces of software for completing the most mundane and time consuming company tasks. What this means for our clients is we’re in a position to deliver a faster, more cost-effective service and add more value in other areas. In a world where people expect things to be done quickly, if not instantly, this gives us a competitive edge against the accountants still trying to run their firm using traditional methods. Having joined MNE from another professional services firm that relies heavily on paper and hard copies, I was astounded to find that MNE was 100% truly paperless – even meeting notes are made on an iPad! Despite a world that gets more digital everyday, the introduction of the Making Tax Digital initiative in 2019 and the increasing popularity of cloud accounting software, I have witnessed a number of incidents over the last year to suggest that a good proportion of accountants are happy to swim against the revolution and take their chances. “Computers will never be able to summarise a pile of bank statements in the way I can”, said a Partner at one accountancy firm. “Can you print out your accounts and deliver them so we can scan them back in”, said another accountant to a potential client. 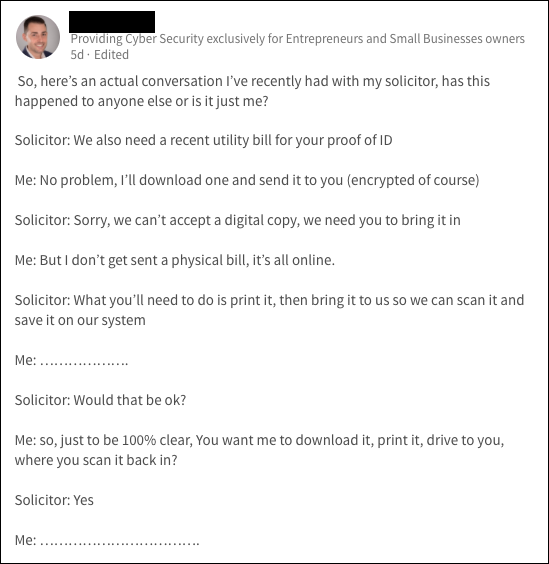 A LinkedIn post from someone equally perplexed at the thought of printing something off only for it to be scanned in again. These are just two things I’ve heard over the last year, but there have been plenty more. One thing I’ve always been sure of prior to joining MNE is that most accountants are late adopters to the “new”. To most accountants, something new is considered a risk. What I didn’t realise was how much of a knock on effect it was having on people’s businesses and the service they received. I’d just always assumed that there was a strong enough professional reason for accountants to work in more traditional ways and to make seemingly bizarre demands such as the one above. The 55% of accountancy firms that don’t believe they need to go to digital to survive I think will continue to ignore the need to move to digital platforms until either further legislation like MTD comes into being, too many clients leave or they go bust. The basic distinction business owners need to make in 2018 is whether they want an accountant who competes with the systems and technology that is emerging, or whether they want to partner with an accountant that is using technology in imaginative ways to deliver a better service. Attending Xerocon back in October was a real eye opener for me. To sum up Xerocon, it’s basically Glastonbury but for bookkeepers and accountants. The MC was a magician, there were food stalls, smoothie bars and a big rave in the evening. But don’t let that put you off. Xero is the cloud accounting software of choice for most accountants. It’s smart, slick and easy-to-use and our clients love it too. Xerocon made me realise that like us, there are lots of accountants across the UK who are striving to improve their relationships with their clients and future-proof their firms. What attendees at Xerocon had realised is that they can no longer be firms that are just compliance factories – it’s not productive for firms or their clients. Instead, accountants have to make the transition towards being growth consultants.